In order to request your Loved one’s Awards (Medals) and Decorations and his/her DD214 you must fill out a SF180. If you already have a copy of his/her DD214 you can skip this section. If not: go to http://www.virtualwall.org. Click on “By Last Name”. Click on his/her First Letter of the last name. Click on his/her last name. Make sure you are clicking on the right one. When the page opens Click on “Full Profile”. You will find information on this page that you will need to fill out the SF180. You will be looking for ID Number: if it is a 9 digit number it is a Social Security Number. If it is a 6 or 7 digit number it is a service number. If your loved one was a Warrant Officer it will have a W in front of the number. Write that number down. You will also see a Grade At Loss. E(enlisted) O(officer). Write that down. 1. 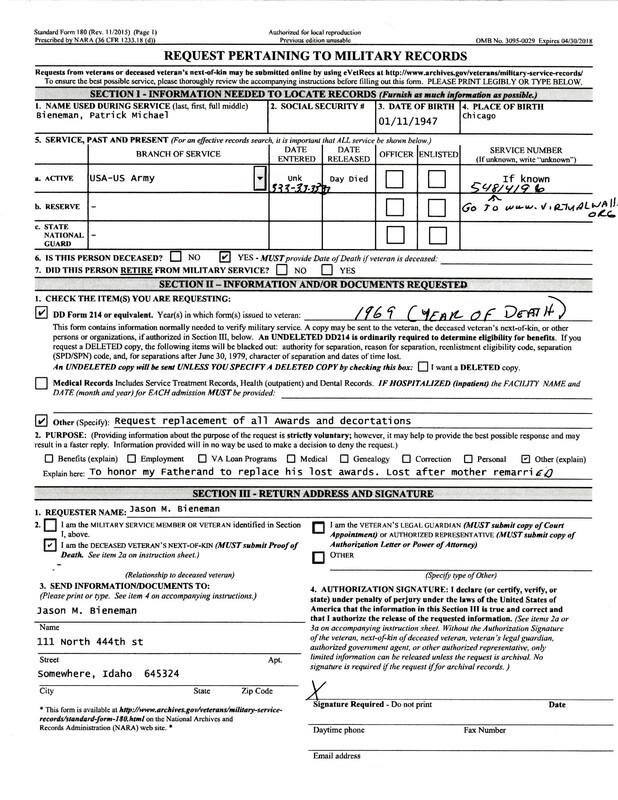 To get this form go to http://www.archives.gov. 2. click on “Request Military Service records”. 3. Go to section “Request Your Military Service Records online”. 4. Scroll down page until you see SF180 in Blue. 5. Click on the Blue SF180. That will take you to a downloadable SF180. You can fill must of it out before you download it or fill it out after you down load. 1, Put in full name (Last name first) to include Full Middle Name. 2. If you do not know his/her Social Security Number. You can put the SSAN in the Social security block or N/A if it you don’t know his/her’s. Then you must put the service number in the service block (see below). 3. Fill in Birth Date 4.Place of Birth. 5a. Branch of Service US Army. Date Entered if you know put it in if not put UNK Date Released is the Date that your Loved one lost his/her life. Check whether he was enlisted or officer. Put Service Number if you have it. 6. X the Yes Box You do not have to show proof of death. Just Put Killed In Action Put an X in the box No for did he/she retire. X the box for benefits and to Honor my Father/Mother,Brother/sister by replacing his/her medals that were lost after several moves or remarriage or fire. X the box I am the deceased veterans next of kin. You must send this form in even if you submitted your request on-line. They will be pulling all items but will not send them until you MAIL this form in.